Hooray! Hooray! I finally finished the Punishment Blanket last night at 10:30. I'm sure my theoretical baby will appreciate it some day. I'm heading over to Loops tonight to get the moral support I need to finish my first sock. On the left: The blanket LIES! It pretends to be easy but really it's a big fat ball of months and months of tedious little knit stitches. Photo of actual passive-aggressive blanket to come. Note to blanket: You can't break me!!!! Here's your reminder. 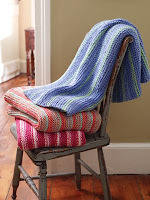 Tomorrow is knitting day -- if we stick around that long. 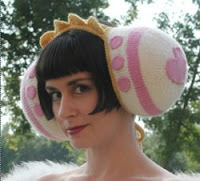 If so, I promise to teach you how to knit these fabulous earmuffs. Editor's note: Natasha! I'm kidding.